What is Darmachakra Mudra? In the dharmachakra mudra, the thumbs and index fingers of both hands touch and form a circle, and the circles touch each other. The three other fingers of each hand are extended. The three extended fingers of each hand are also rich in symbolism. On the right hand, the middle finger represents the Buddha’s audience, the ring finger stands for the few who realize his teachings, while the little finger is the Great Vehicle (Mahayana). The fingers of the left hand represent the Buddha himself, the law of Dharma and the Sangha. Often the left palm is turned toward the body and the right palm away from the body. who are distinguished by this mudra are Atisha, Tsongkhapa, Asanga and Sakya Pandita. 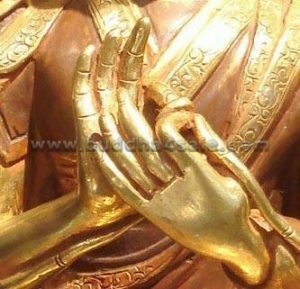 So where is the best FengShui placement for a Dharmachakra Mudra Buddha? It is highly recommended to consecrate a Dharmachakra Mudra Buddha In the home office or library/study, etc. Just by looking at this Buddha hand gesture one can connect to the energy of deep peace and serenity. It is a powerful FengShui decor adapt to any places!